You do not need bloated enterprise software to effectively track your inventory. This tutorial will help you develop your own custom inventory tracking system so you can make smart inventory decisions based on timely and accurate inventory data. Our Inventory System requires the standard commercial phpGrid and phpChart license as it needs a few advanced features from both components. An inventory management system has several critical components. At its core, inventory control works by tracking the two main functions of a warehouse — receiving (incoming) and shipping (outgoing). Other activities such as movement, or relocating, of inventory also take place. Raw materials are decremented and finished goods are incremented. Typically, an inventory system has four basic elements – products, purchases, orders, and suppliers – which must be tracked based on their location, SKU, and quantity. Current inventory, or products on hand, is updated by tracking incoming shipments and outgoing orders. Order alerts can be set to trigger when inventory levels fall below custom-defined minimum levels. Download the InventoryManager.sql SQL script from this tutorial’s GitHub repo, and then execute the script using a MySQL tool such as MySQL Workbench. 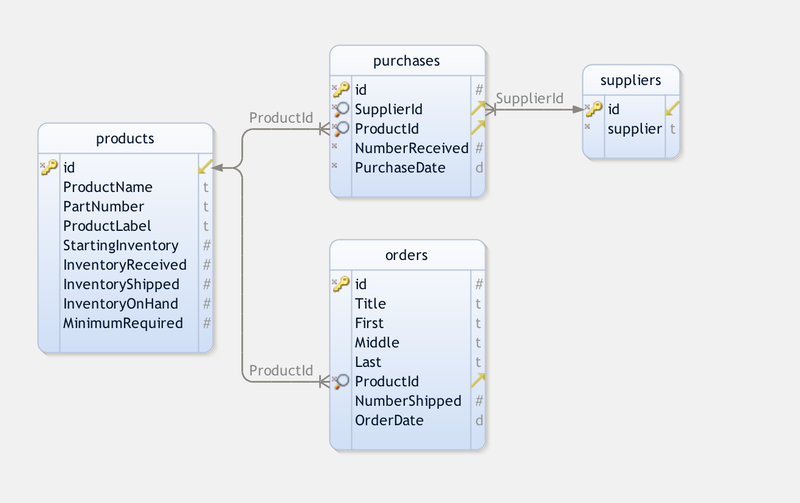 This will create a new database named InventoryManager as well as the tables needed for this tutorial. We will use a datagrid component by phpGrid to handle all internal database CRUD (Create, Remove, Update, and Delete) operations. Be sure to download a copy of phpGrid before you proceed. The include file for the menu is stored in an inc folder named menu.php. The code for the menu is straightforward. For the sake of focus, we will not go into great detail. Feel free to look at the code inside the inc folder. We have also added a menu item named Reports. Let’s start with the Current Inventory page. Incoming purchases increase the inventory while outgoing orders decrease it. From a master-detail perspective, the Current Inventory has not one, but two detail datagrids – the Purchases (incoming purchases) and the Orders (outgoing orders). Therefore, the Current Inventory page is composed of one master grid – the Current Inventory in stock – and two detail grids – Incoming Purchases and Outgoing Orders. We can easily present these relationships using the phpGrid one master and multiple detail datagrids feature. If you have read the last tutorial Building a Donation Manager from Scratch, you will have no problem following the code below. Note the use of the set_col_format() function used to format the integers. Now, let’s make a few changes to enhance our Product datagrid. First of all, we will add some conditional formatting so that whenever the InventoryOnHand is set to zero or a negative value, it is displayed using a different background color. We will use the set_conditional_format() function for this purpose. The above code adds a display condition so that whenever the InventoryOnHand field has a value that is less than (lt) one, the text color changes to red and the background color to dark gray (#DCDCDC). The code below uses a for loop to iterate through each row in the Products datagrid. It compares the inventoryOnHand with theminimumRequired and, when condition is met, it will use thesetCell function to change the background color. Next, on the same page, we need to see the purchases coming in (Incoming) and orders going out (Outgoing) for a specific product. Both detail grids use the same foreign key ProductId to link to the master datagrid – Products. The next page is the Incoming Purchase page. It is similar to the Purchase Detail Grid we saw when setting up the Current Inventory page. We group the purchases by ProductId and display the sum inNumberReceived. Any incoming purchases will increase the inventory. The next page is the Outgoing Orders page. It is similar to the Orders Detail Grid from the Current Inventory page. Here, we will introduce an advanced function called set_grid_method(). This tutorial builds a simple and extendable inventory system in less than 50 lines of code. The progressive style of these tutorials also helps the reader to ultimately become more familar and comfortable with phpGrid by introducing a limited number of new phpGrid features in each one. This marks the end of the code needed to create the datagrids required for this tutorial. However, we are not done yet. There is still one more page we need to create — Reports. We will cover that after the jump. What is an inventory system good for without some of type of report? 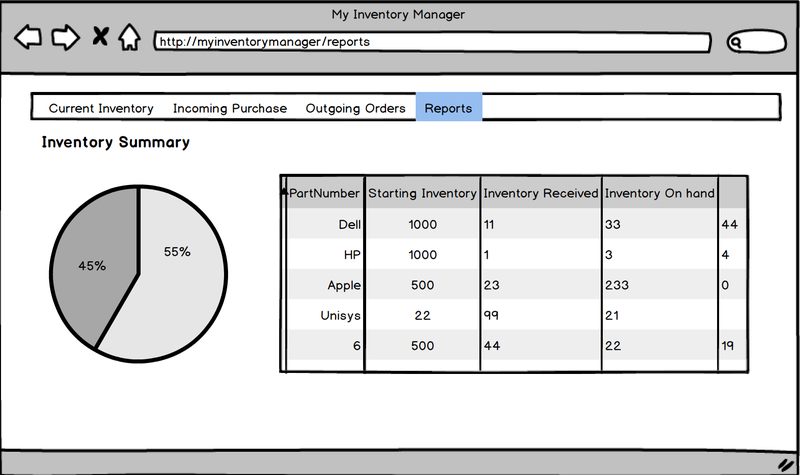 In this section, you will learn how to use phpChart – which seamlessly integrates with phpGrid – to create visually pleasing and useful reports for your Inventory Manager application. Before we start, we need to install phpChart. It is recommended that you obtain the full version of phpChart since the free version – phpChart Lite – supports only the line chart. It’s important that we keep phpGrid and phpChart in separate folders. Below is the recommended folder hierarchy. 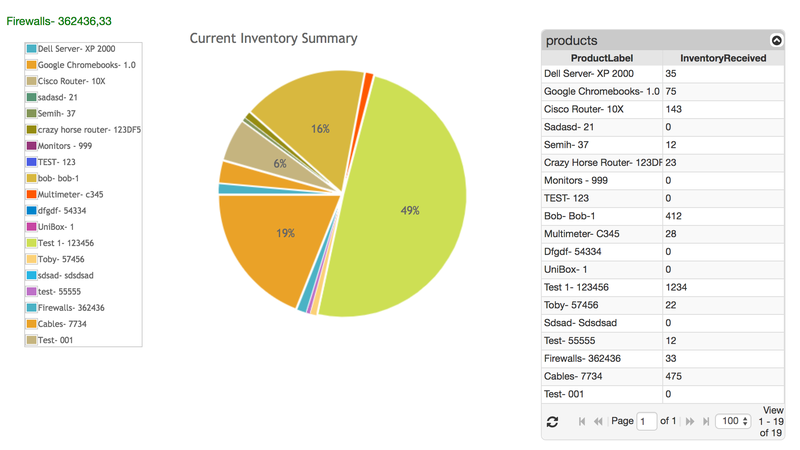 We will place a pie chart next to an inventory summary grid. The datagrid provides the series data to plot the pie chart. First of all, include calls to both conf.php files at the beginning of the code. The first line is the constructor. We pass array(null) as the series data because we don’t wish to have any data displayed in the pie chart initially as the inventory data used to plot the chart is not yet available when it is first initialized. The data is fed from the datagrid later in JSON. We also give our chart a unique name, PieChart. Next, we give it a title. Nothing fancy here. Once we have the title, we call the series default function to set the renderer to PieRenderer. Unlike a bar chart, a pie chart does not have a Y axis. We can also set the rendererOptions property. We will not go into each option in detail here, but you can find more information in the online documentation. We also want to show a legend. The set_legend command below shows the legend to the west (noted byw) or to the left of the pie chart. We will also remove the border and the background. Finally, we draw our chart by giving it a height and width in pixels. However, if you execute the code now, you will not see the chart because the data used to render it isn’t available yet. Here, we will use the same the inventory datagrid as we did in the Products page. We just need to add one more thing – an event handler. Since we must wait for the datagrid to finish loading before it can send the data to plot the chart, we use the event jqGridLoadComplete. jqGridLoadComplete is last event that occurs once the whole datagrid body has finished loading. Note that the grid body will be reloaded if the user changes the sort order of a column or sets a filter. Now there you have it. 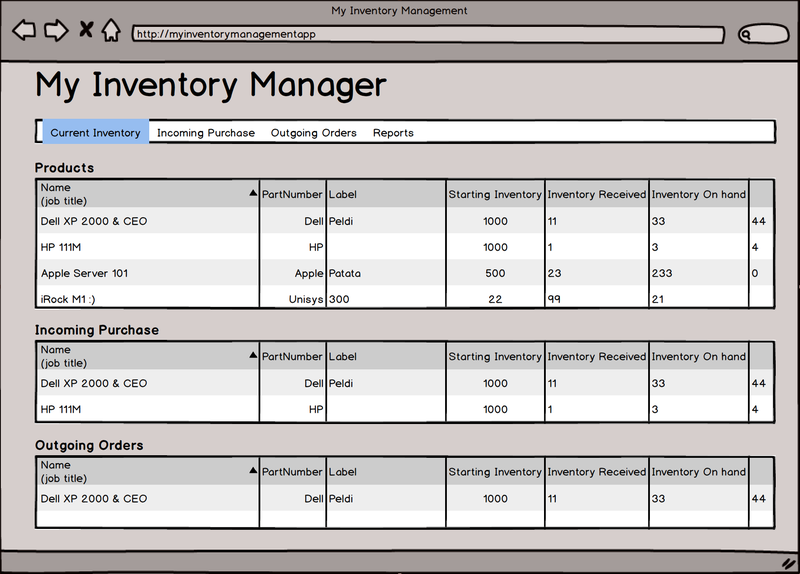 Your just built your very first inventory management system from scratch using only PHP and MySQL!